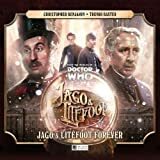 Big Finish's surprisingly long-running series Jago & Litefoot comes to an end, following the death of one of the leads Trevor Baxter, and the finale is quite heartwarming and rewarding for longtime fans. Newcomers won't be totally lost and can find some fun in this, but as a finale, it is most certainly geared towards longtime listeners. Henry Gordon Jago's good friend George Litefoot is missing, and it is up to Jago to find his lost friend, all while battling his own memory loss. It is a story that celebrates the duo, and all of their friends both regulars of the show and recurring characters. Christopher Benjamin anchors the story with a fantastic performance, and his co-star Trevor Baxter is able to appear via archival recordings. In many ways, the story not only serves as an end to the series, but it is clearly built as a tribute to Baxter, who unfortunately passed before they could record together again. It is an excellent finale, saying goodbye to the likable pair and their friends in a lovely tale that is both fun and poignant and ends their Victorian Adventures on a high note. Also included in this set is The Jago and Litefoot Revival, which is a "Short Trips" story performed by Benjamin and Baxter, and tells of an adventure the pair had with two separate Doctors, the Tenth and Eleventh. This is a fun lark as well, if for no reason other than to get a bit more of Baxter in the role before his passing. This series brought two actors who hadn't seen each other since they walked off that set of The Talons of Weng-Chiang in 1977, and brought them back together...and fans of their adventures will no doubt enjoy their final adventure together. A great way to say goodbye to Baxter and the whole series. Fans of Jago & Litefoot rejoice, Jago & Litefoot Forever is a great farewell. It is kind of amazing what Big Finish can do. They can somehow base a series around two characters that appeared in one story in 1977, make it a success, and then for a bit of a fun event, have them crossover with a recurring character from the new series. And it can still be fairly accessible for newcomers. These adventures don't really require a ton of backstory for you to find them enjoyable. I am aware of Jago & Litefoot from their lone appearance in the 70s, and while I've not really had too much chance to dive into their Big Finish run, I have enjoyed nearly all of their appearances in regular Doctor Who adventures. This adventure, in which they team up with New Series recurring Sontaran Strax. It's a smart use the newly acquired Big Finish license, which gives them use of New Series characters. Why not take your classic series spin-off featuring a couple of guys solving paranormal and alien mysteries in Late Victorian England, and team them up with at least one member of the New series team that does the same? In this Two-Part story, titled "The Haunting," Strax ends up assisting Jago & Litefoot on a supposedly haunted house mystery...though the entire time he thinks they are just Vastra and Jenny undercover. Strax is dumb. Which is fun! The entire two-part mystery is good fun. 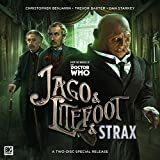 Jago & Litefoot have a good rapport, and Strax is usually a pretty funny comic relief to the Paternoster Gang, so the story has a good comedy line-up. Oddly, that comedy team is investigating murders in a haunted house. That is the fun of it. I rather enjoyed this story. It is light, funny, with just enough drama mixed in to balance it all out. As someone who was only mildly familiar with the Jago & Litefoot series before I began this, I can say it is definitely accessible to newcomers, and if anything it just makes you want to listen to more from this series.